If you're getting discouraged throwing money away on rent each month, it may be time to get into your own home. Turn those rent payments into mortgage payments and start building your home's equity. We offer competitive rates and affordable payment plans to work within your budget. 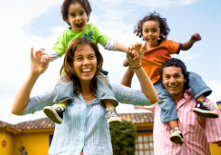 We also offer a variety of mortgage programs for customers unable to qualify for traditional lending. Talk to a FSB lender about your particular needs. No two people's financial situations are the same, so why should all mortgages be equal? We offer a variety of mortgage programs to fit your needs, because we believe everyone should have the chance to own a home.